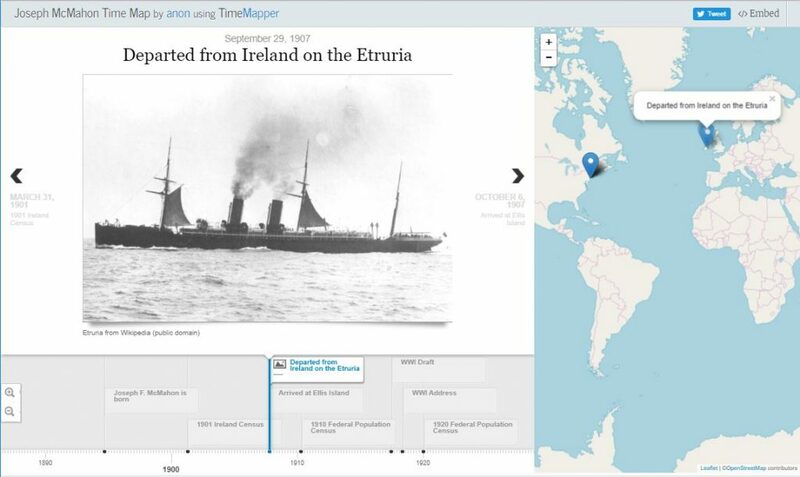 Have you checked out TimeMapper? 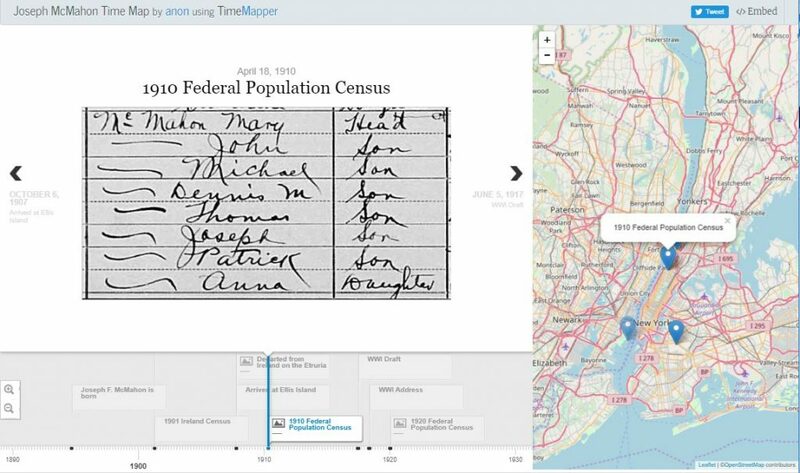 Recently, one of the people I follow on Twitter mentioned using TimeMapper to create timelines with maps. If you have attended one of my lectures, or read my books, you will know how important it is to build timelines. Maps are also vital to understanding our ancestors. So imagine how exciting it would be to combine timelines and maps together. TimeMapper is a is free, open-source tool that is a product of the Open Knowledge Foundation Labs. TimeMapper. can be found here. 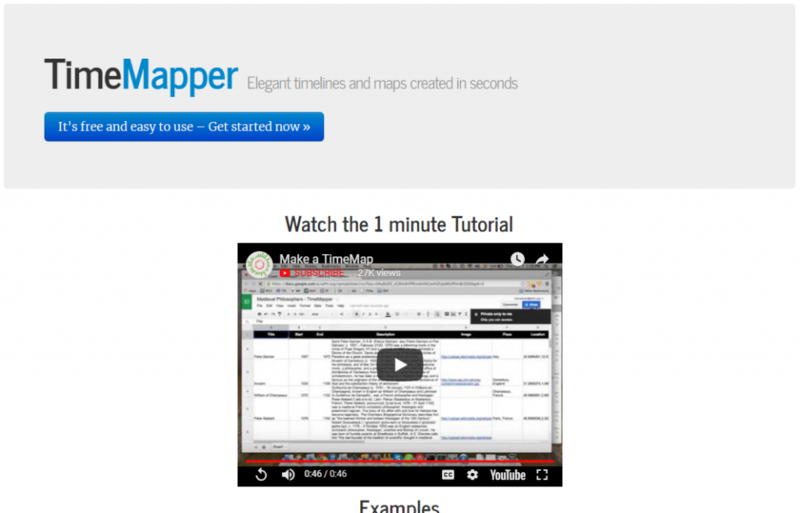 On the main TimeMapper page there is a 1 minute tutorial to show you how it work. I recommend taking the minute to watch it. There are three steps: Create a Spreadsheet; Connect and Customize; and Publish, Embed and Share. You can create an account by signing in with your Twitter account. Ny using your Twitter account, you could use TimeMapper as a Twitter app. As an app, it can read the tweets from your timeline and see who you follow. I chose to use it anonymously, using a spreadsheet published on my google drive. You don’t have to sign in, or upload your own spreadsheet to see how this works. You can use an example spreadsheet on the webpage to view a TimeMap for “Medieval Philosopher’s Timeline”. Using their sample is a great way to get started. On the left you can scroll through the events in the spreadsheet, with the timeline under them. On the right is a map with the events. It is easy to use the spreadsheet template, by copying it to your google drive. The spreadsheet with the TimeMapper Template can be found here. When you create your own TimeMap, the locations for events have to be given in latitude/longitude (or JSON) format. The google spreadsheet contains a google docs formula to look up latitude and longitude, so that the location names can automatically be translated. Add the web addresses (urls) of any images you want to appear with an event in the spreadsheet. You have to delete the top row in the spreadsheet with the instructions. The last step is to publish the spreadsheet to the web. I copied the timeline to my google drive, then entered data into the fields to create a timeline for my Grandfather. I followed the instructions in Step 2 to Connect and Customize. Step 3 was to publish. Use the arrows to cycle through the events, and a corresponding caption location on the map will be displayed. There is a timeline under the events. The map can be expanded portion can be expanded to get a view of locations that are close together. The TimeMap cannot be downloaded to your computer., but the link to it can be shared. There are options to share your TimeMap to Twitter, or you can copy and paste a link to your TimeMap. Many thanks to @MNdoughboy1918 for sharing this tool on Twitter. 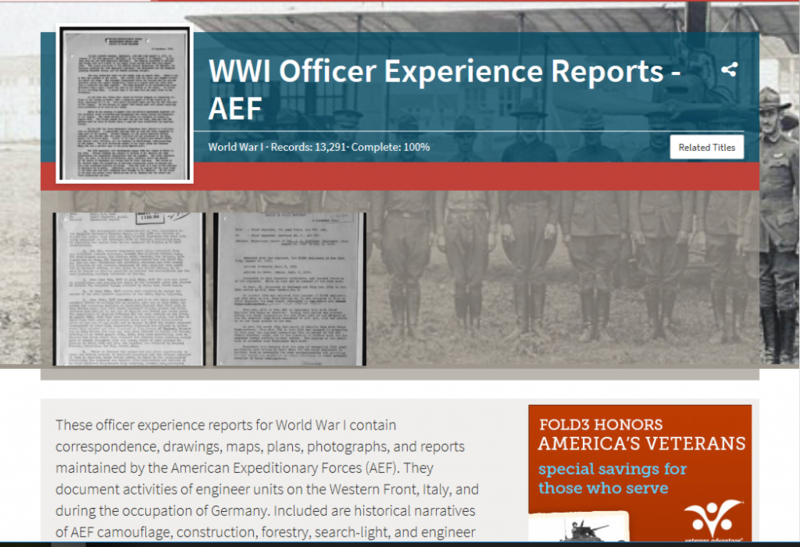 This week I have been working with an interesting record set, the WWI Officer Experience Reports-AEF on Fold3. These records are reports from officers about engineering activities in the AEF. Although there are names in these records, their usefulness goes beyond individual names because they hold information about the military organizations. The names are those of the officers filing the reports to the Chief Engineer of their Army, but the activities are those of the whole military organization to which they were attached. 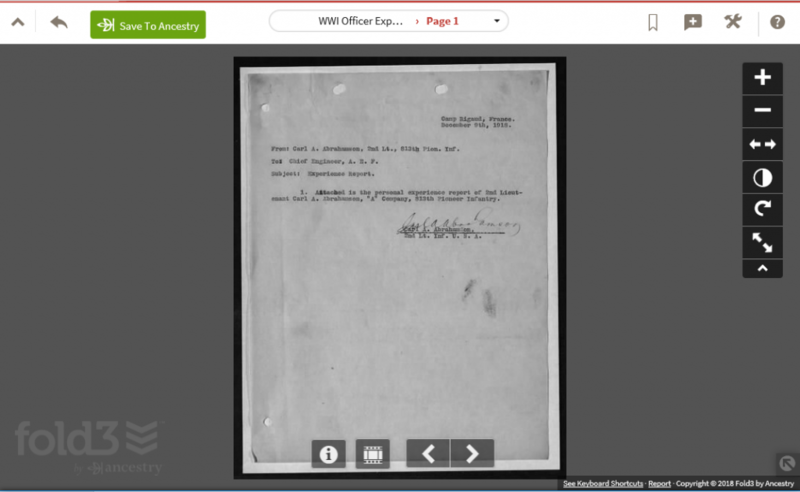 If you had a WWI Ancestor who served with engineers in the U.S. Army, you might want to check out these records. The reports are individual accounts of the activities of the engineering officers. It is interesting to read the approach each officer took to telling his story. Some accounts are written in first person, some in third person and there are even poems. Comparing the different accounts of the same event is also interesting. One example is the 816th Pioneer Infantry experience on the trip to France. The Regiment traveled on three ships; one of which had engine trouble and fell out of the convoy. The reports differ on which day the engine trouble began, and how it was remedied. One report gave an officer’s impressions of sub-watching duty in a crow’s nest with a group of sea-sick men. Most accounts discuss the work done by the engineers, and the officers give examples of the contributions of their men and how proud they were. A few officers express disappointment at arriving in France just before the cessation of hostilities. Then, there are personal accounts like the Lieutenants who hitched a ride to the front with some performers and ended up at a village between the lines. 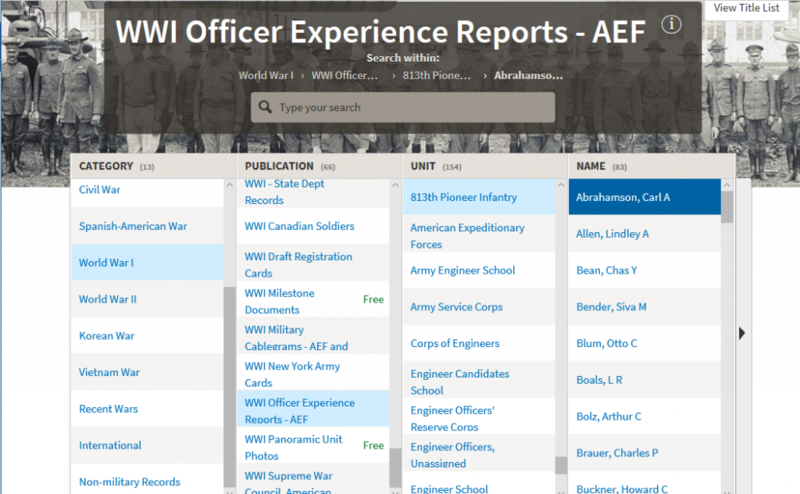 The WWI – Officer Experience Reports can be found here. When we try a new database it is natural to search for a name or a keyword. For best results, enter your engineering soldier’s name with his military organization. After you have searched for names, you may find that a better way to go through the records is to browse them. Next to the search box is a “Browse” button. You can also browse the records here. When you select a name, you will find that officer’s experience report. The reports may be typed or handwritten. You may find that there the officer made duplicates of the reports. Browse to the military unit and search the subset of records by entering keywords and selecting the keyword option from the drop down menu. 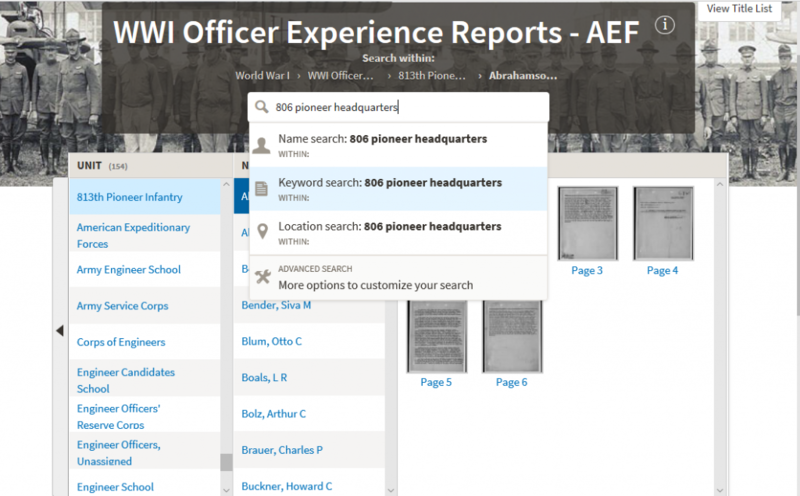 In the example below, with the 806th Pioneer Infantry Regiment records selected, I entered the keywords: 806 pioneer headquarters and selected keyword search from the dropdown menu. The results of the example search are shown below. No matter how you get to the records, click on the thumbnail of a page to see a larger image of the page and interact with it. You can read the page online, download it, bookmark it on Fold3 (when signed into an account) and save it to an individual on a family tree at Ancestry.com (when signed in). You can also use the arrows on that appear at the bottom of the page to move forward or backward through the pages of the record set. For those who share my interest in the Pioneer Infantry, you will find that there are reports from the 59th, 806th, and 813th Pioneer Infantry Regiments. The value of personal accounts cannot be overstated. By committing these stories to writing, the officers are able to share what they did and saw and felt. These reports bridge the century between both of you, so you can spend time to hear the stories they tell. Are you a “Genealogy Detective” or a “Genealogy Engineer”? At a conference a while back, I noticed how many of the presenters were engineers. That got me thinking about how engineering skills help in genealogical research. Then I wondered if genealogists might be more like engineers than detectives. Usually, genealogists think of themselves as detectives. That makes sense as we interview people, dig through records, and scan for the smallest details of an ancestor’s life. We try to connect the dots and align different versions of an ancestor’s life to establish the truth. We use timelines. We look for good quality resources to use in our exhaustive searches. We focus on including the largest and the tiniest details to build our case. Engineers and detectives use similar practices in their work. Detecting is certainly a part of engineering. Like detectives, engineers stay focused on a problem. Engineers also bring all the resources that they can to bear on solving a problem. In flight test engineering, I have had to research a system and all its details, employ strategies to compare and combine feedback, and interview participants to solve problems. Engineers know when to use an estimate and move on with the bigger problem. They keep a list of assumptions and revisit the estimates to make sure that they remain reasonable. Seeing the similarities then brought me think about the differences between detectives and engineers. How are detectives and engineers different? I asked several friends what they saw as the difference between detectives and engineers. There were interesting themes that emerged. While there are different goals in their work, engineers and detectives employ a similar skillset. However, detectives are limited to interpreting the facts in front of them, and engineers look at what can be built using what is available. Engineers look to the future and have to consider safety. Engineers have to look backward to analyze requirements, solve a problem, then look forward to prevent the problem from happening again. Like an Engineer: In genealogy, we want our conclusions to be relevant in the future. We also do not want to make the same mistake twice. Detectives can usually go into the field to observe clues. Sometimes engineers don’t get this luxury. They are told what went wrong and have to figure it out without touching the original system. In flight testing some reports simply cannot be duplicated on the ground. It can take a good amount of research, dissection and imagination to figure out what caused these problems. Like an Engineer: Until there are time machines, we cannot return to an ancestor’s lifetime to view all the facts right after they occurred. Like an Engineer: Given the same information, would other genealogists reach the same conclusion? If you reanalyze all the information starting over, would your conclusions be reproducible? Result: Perhaps, I am more of a genealogy engineer. Special thanks to: David, Dave, Andrea, Beth, Deb and Mark for your insights. Recently I attended the monthly meeting of the Anne Arundel Genealogical Society about “What’s New on FamilySearch” given by Michael Butterworth who is a Director at the Annapolis Family History Center. FamilySearch has new features and new mobile apps. FamilySearch now has FamilySearch Places to help you research localities. You can learn more about it here. Map You Ancestors is a part of the FamilySearch mobile app. Learn more about it here. Only you can see the live people you enter into the FamilySearch Family Tree. If another user enters the same live person that you have entered, then there will be duplicate entries for that person. Always look at the symbols next to search results. A camera icon means that there is an image available for the record. A document icon lets you view the record details. A mini-pedigree chart means that the record has been attached to someone in the FamilySearch Family Tree. Clicking on that icon will bring up a popup window with the individual’s profile summary from the tree. What you access can change based on the currents laws, the number of users, and the place you access it from. Always try to access a record at home first. If home access is unavailable, then you will get a popup box telling you where the record can be accessed. Some choices are: at a partner site, at a Family History Center, or on a filmstrip. For some records, only a transcription may be available. If the record is only on filmstrip, you will get information about where a filmstrip might be found. Family History Centers still have some filmstrips (Annapolis has 600+ microfilms, 650+ microfiche). If the record is only on a filmstrip, call FamilySearch at 866-406-1830 to request that the filmstrip’s digitization move up in priority. 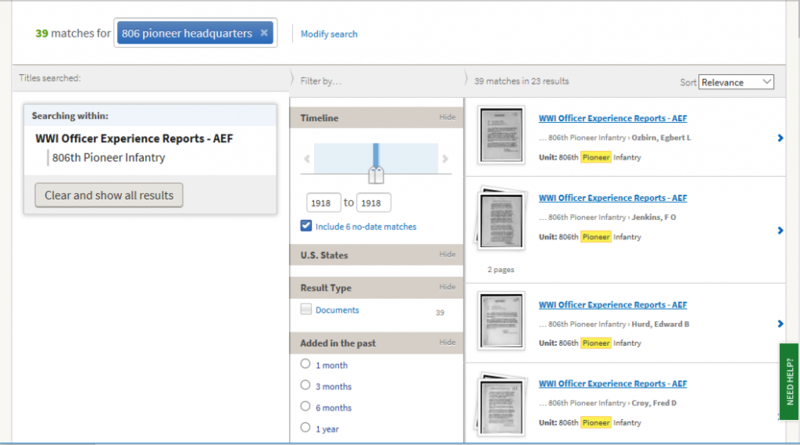 FamilySearch does track the demand for the filmstrips, and your call may bump up the scanning priority. Hiring a professional researcher can be a great idea but may be intimidating to some genealogists. You may have questions about how to pick one, or how to work with one. Rebecca Whitman Koford, Certified Genealogist®, graciously agreed to an interview to share why you might want to hire a professional researcher and how to get the most out of the experience. When should a person hire a professional researcher? There are many reasons to hire a professional researcher. It all depends on your goal. You can hire a professional researcher when you do not have the time to do the research yourself. A researcher can provide you with stories, that in turn, can get you started on your own path to finding out more about your ancestors. A professional researcher can also be a consultant to boost your own research. By evaluating the research you have done, a professional can give you guidance on developing your own research plan. How should a person select a professional researcher? For the best outcome, do your homework. The researcher’s specialty matters. Specifically, find one who specializes in your ancestor’s locality, culture and language. Google them, looking for articles they might have written or webinars they might have done. Based on your research goal, focus on a researcher’s locality. Can s/he access the original records located at the state and county levels? Ask for a sample of a written work product. All research should include a written report. It is important to know what documentation you will receive and this should be specified in the contact. Have a contract. A professional researcher will offer a contract, which is the beginning of smart and effective communication. The contract will outline the goals and responsibilities of the research. The contract is the beginning of good communication in any professional relationship. Consider the researcher’s certifications and/or experience. A certification or accreditation awarded to a researcher means that the person’s work has been reviewed by peers in a third-party testing process. Educational certificates from genealogical programs are not the same as certifications. An educational certificate shows that the participant has received training. There are many excellent and well-regarded researchers who do not hold certifications, so you will have to judge if they have the specific experience needed to reach your research goal. You can also ask for a resume. You can find a listing of certified genealogists at the Board for Certification of Genealogists (BCG) website ) or accredited genealogists through the International Commission for the Accreditation of Professional Genealogists (ICAPGEN) website. Many professional genealogists advertise through the Association of Professional Genealogists (APG) website . What should the person show the researcher at the beginning of the process? It is your responsibility to communicate all that you know about the ancestor. Imagine how frustrating it would be to get a report that included facts you already knew! Be sure that you gather all the information that you have about the ancestor. It is important to show the facts that you know, and how you know them. These facts provide the researcher a smart path to your goal. Include copies of records you have, and other information you know, such as the ancestor’s location(s), religion and occupation. Stories you have collected are also helpful, as they may lead to records. An example would be disputes that you have heard about; those disputes may have generated court records. The specific source of all the facts is also important. Be sure that each fact has a corresponding source, showing the record location, book and author(s), and web address (url). For example, if your source is a tree found on Ancestry.com, be sure to give the url of that specific tree. Include the sources you searched that did not have results for your ancestor (negative results), so you don’t pay the researcher to duplicate what you have already done. Can it be a lot of work for the client to gather the material and write a report for the researcher? It is an investment in your time. If you spend time reviewing what you know, you become better educated about your ancestor. When the researcher returns the results, you will be better able to understand them and to make connections between report and other members of your family. Rebecca is the Program Administrator of the ProGen Study Program, which is an online self-study program to encourage genealogy education, using assignments based on chapters from Professional Genealogy: A Manual for Researchers, Writers, Editors, Lecturers and Librarians, edited by Elizabeth Shown Mills. If you are interested, the waiting list to begin in a group is between six months and a year. Learn more about the ProGen Study Groups. 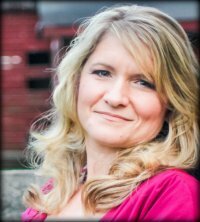 Rebecca Whitman Koford holds a Certified Genealogist® credential. Her focus is in American research with special emphasis in Maryland and military records of the War of 1812. Rebecca has been taking clients and lecturing since 2004. She has spoken for the National Genealogical Society Conference (NGS), Association of Professional Genealogists Conference (APG), RootsTech (2018), webinars for Legacy and APG, the Maryland State Archives, and for groups in Maryland, Virginia, New Jersey, Pennsylvania, Washington, D.C., and Delaware. Rebecca is the Course I coordinator for The Institute of Genealogical and Historical Research (IGHR). She is a board member of the Maryland Genealogical Society and volunteers at the Family History Center in Frederick, Maryland. She has published articles in the NGS Magazine, APG Magazine, and the Maryland Genealogical Society Journal. She is a graduate and former group coordinator and mentor of the ProGen Study Group, an online peer-led study program based on the book Professional Genealogy by Elizabeth Shown Mills; she was appointed ProGen Administrator in January 2015. Rebecca lives in Mt. Airy, Maryland, with an active teenager and a very patient husband. was appointed ProGen Administrator in January 2015. Her research specialties are: Civil War ; Federal Records ; Land Records ; Latter-Day Saints (Mormon) ; Lineage Societies ; Court Records. Unfortunately, Rebecca is not accepting new clients at this time. We’ve all watched and enjoyed specific television shows dedicated to genealogical audiences, such as “Who Do You Think You Are?” and “Genealogy Roadshow”. But are you learning about genealogy from other TV shows? The investigation phase of each episode is filled with techniques to search the internet and social media for a person’s real identity and location. You may have had an ancestor who used aliases or whose images might be clues. Family stories can turn into treasure hunts. There is always a grain of truth in the stories that are handed down. It may take a lot of digging to find the truth. As a metaphor for the search for ancestors, the number of pits promise riches but yield conflicting clues. No ancestor was an island. Each person is surrounded by family, neighbors, and a community. Neighbors like Penny remind us that sometimes our ancestors did not travel far to find spouses. Coworkers can become part of a family of choice. Those non-blood relatives may have pictures you have never seen and stories about your ancestors you have never heard. Make a hypothesis! Assemble all possible information you can. Then test it, to see if it is: busted, confirmed, or plausible. Modify your hypothesis as necessary. Are any of the shows that you enjoyed as a child rerun on television? Watching them may be a pleasant enough experience on its own. When you watch them, they may trigger memories of times and places. Those memories are great to capture. But a deep memory may also be the key you that unlocks a clue to solve one a pesky family mystery.